Wow! It’s hard to believe that another Crew year has come to an end already. It’s been a busy, fun, inspiring year with lots of incredible companies sharing their products with our team! 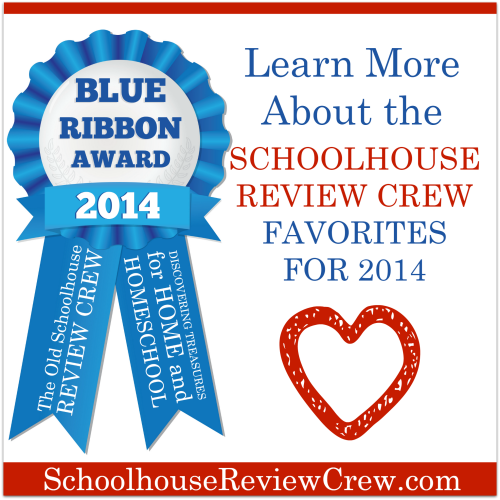 Since the beginning of the Schoolhouse Review Crew, we have taken time at the end of the Crew year to vote for our very favorite products. It’s not an easy thing to do, choosing a favorite from among so many greats, and trust me when I say, there was crazy competition, with some of these awards won by the margin of just a vote or two. We are so grateful for the honor of getting to know all of these companies through these opportunities, and today we’d like to share our choices for the 2014 Blue Ribbon Awards! The Crew reviewed products from a total of 58 companies in 2014. 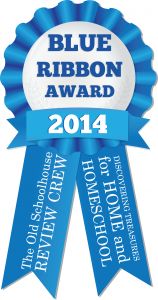 We are handing out 27 Blue Ribbons, to a total of 23 companies! I hope you enjoy reminiscing with us. If you click on the company names below, you will be taken to our reviews of the products we are honoring today. Favorite Christian Education Curriculum: Apologia: What On Earth Can I Do? Members of our Crew are blogging about their personal favorites from the year. If you’d like to read more about what they thought, click on the banner below. Congratulations to all of our Blue Ribbon Award winners, and thank you for giving us the privilege of serving you this year! We are looking forward to an amazing 2015! Members of the Crew are sharing their thoughts about the Blue Ribbon Award winners and the companies they voted for who may not have won. To read more, click on the banner below.